A 75-year-old male without significant past medical history presented with acute chest pain to the emergency department and was diagnosed with non-ST segment elevation myocardial infarction. The patient was admitted to the hospital and placed on a heparin drip in anticipation of cardiac catheterization. 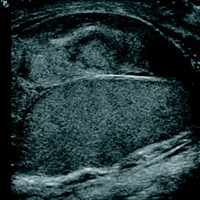 Three days after the admission, the patient complained of new onset testicular pain and progressive testicular swelling. 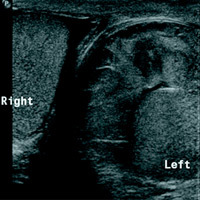 Sonographic comparison view of both testicles and sagittal grayscale ultrasound of the left testicle demonstrate a complex heterogeneous collection around the left testicle. 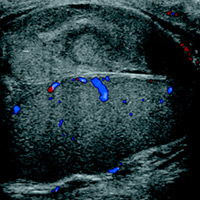 There is associated mass effect on the left testicle, but color Doppler evaluation shows preserved intratesticular blood flow. The testicular parenchyma is normal. Acute onset of a large hematocele can mimic testicular torsion due to the mass effect on the testicle and compromise of blood flow.4 Evacuation of the hematoma is indicated for symptom relief and restoration of normal intratesticular blood flow. Medical/surgical history and clinical presentation usually suggest the diagnosis, especially in the acute phase. Additionally, sonographic features of an acute hematoma are most often characteristic. In other cases, particularly in those with atypical presentation, consideration of differential diagnoses including multicystic testicular tumors such as cystadenoma/cystadenocarcinoma of the rete testis and complicated testicular abscess are warranted. — Anna Luisa Kühn, MD, PhD, is a second-year radiology resident at the University of Massachusetts Medical School in Worcester, Massachusetts. Bhatt S, Dogra VS. Role of US in testicular and scrotal trauma. Radiographics. 2008;28(6):1617-1629. Deurdulian C, Mittelstaedt CA, Chong WK, Fielding JR. US of acute scrotal trauma: optimal technique, imaging findings, and management. Radiographics. 2007;27(2):357-369. Archer A, Choyke PL, O’Brien W, Maxted WC, Grant EG. Scrotal enlargement following inguinal herniorrhaphy: ultrasound evaluation. Urol Radiol. 1988;9(4):249-252. Dogra VS, Bhatt S, Rubens DJ. Sonographic evaluation of testicular torsion. Ultrasound Clin. 2006;1(1):55-66. Copyright © 2016 Great Valley Publishing Company Inc., Publisher of Radiology Today. All rights reserved.